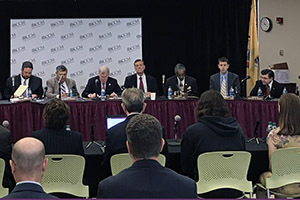 The bipartisan Legislative Manufacturing Caucus met today at the County College of Morris to discuss education and technical training needs in New Jersey, part of the development of a proposed bond issue for next year’s ballot. “The bond issue would be a big step in our much-needed efforts to increase the capacity of our vocational-technical schools to link students and our New Jersey manufacturing companies that are looking for skilled employees,” said Michael Wallace, Director of Employment & Labor Policy and Federal Affairs at NJBIA, who was on hand at today’s meeting. A vocational-technical and job training bond issue was first proposed by Senate President Steve Sweeney in August. Part of the meeting mission today was to fine-tune a needs assessment to better determine how much money would need to be bonded to help cover the expansion of the state’s network of 21 county vo-tech schools. A ballot measure would need to be approved by both houses of the Legislature before being turned over to voters. Testimony today was provided by Robert Staudinger, President and CEO of the National Manufacturing Company and Co-Chair of NJBIA’s Manufacturing Network, and Judy Savage, Executive Director of the New Jersey Coalition of County Vocational Technical Schools, among others. NJBIA had long advocated for the Legislative Manufacturing Caucus, which held its first meeting on Aug. 15. Manufacturing is a $44.5 billion industry that employs more than 240,000 workers in New Jersey. NJBIA estimates that 82 percent of the state’s manufacturing GDP comes from the pharmaceuticals, machinery, computers and electronics, and food preparation sectors. Now a days technical skills are very important for corporate industry. Here is the best technical skill training academy in Jharkhand i.e, Involute Skill Academy for more information please visit our website. Thank You.